All DJs and musicians get song requests from their audience. Most would rather get them ahead of time and not just before or, worst of all, during shows. Even for DJs with huge selections of songs, last second requests from clients and audience members can mess up months of careful planning. 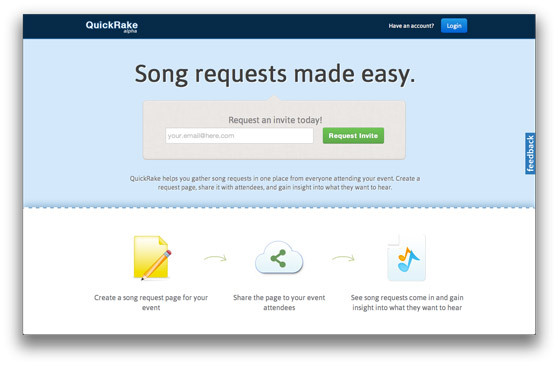 Lucky for you, GigMasters just learned about QuickRake - a new service that makes it easy for entertainers to gather song requests from party planners and guests. And to help get the word out about this cool startup, we have free QuickRake invites to give away! The idea for QuickRake came from Rishi Talwar, a long-time DJ with a passion for technology. Last year Rishi was booked for a corporate holiday party and was told by the event coordinator that many of the party’s attendees had song requests they wanted to hear. Rishi needed a quick and easy way for all the guests to make their requests. A couple days and presumably late nights later, Rishi had developed the first prototype for QuickRake, allowing the guests to log in and submit their song requests. He quickly collected over 65 song requests and he knew he was onto something. A few months and some additional features later, Rishi and co-founder Hajime Furukawa are getting ready to offer QuickRake to the general public. Luckily they’ve kept thing simple. QuickRake lets its members create ‘request pages’ for upcoming events. 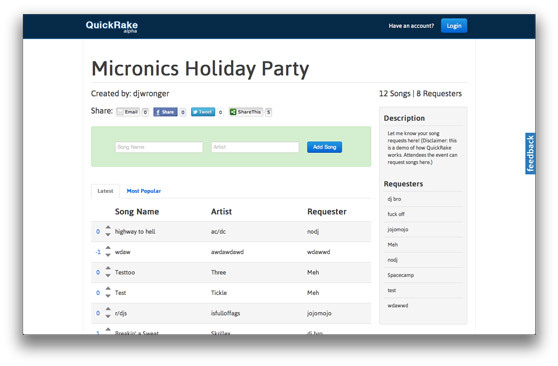 You and your guests can add song requests and QuickRake will keep a running tally. It’s fun for the guests and it lets you, the entertainer, know exactly what your guests would like to hear. Simply ‘like’ or ‘share’ this post on Facebook, which Facebook users you can do just by leaving a comment below. Not on Facebook? That’s cool too. Leave a comment using a different service and we’ll get the invite to you that way. We've only got twenty requests to give out so please, as they say, ACT NOW! To learn more about QuickRake, check them out at QuickRake.com. And let us know what you think!